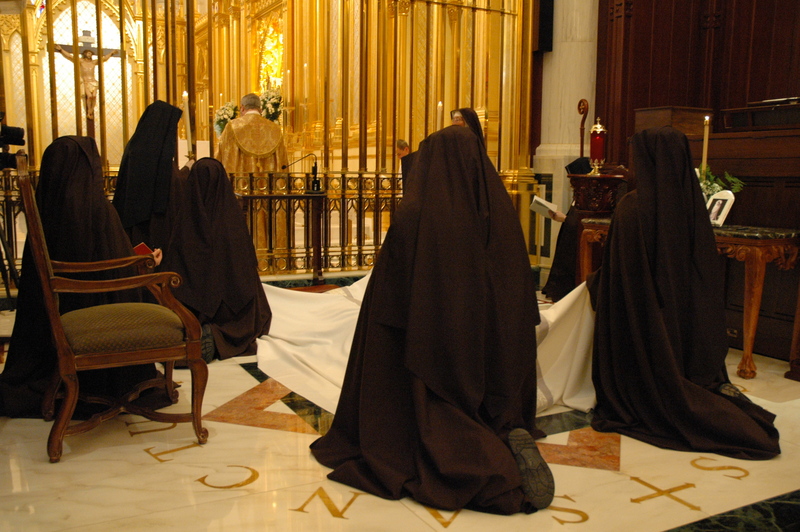 Seven years ago today, July 7, 2007, I had the honor and privilege of making my solemn vows as a nun. It’s so hard to believe seven years have passed since that day, which seemed a life-time away for so long. Here are some pictures I managed to find from the vow ceremony, which takes place during Mass. Okay, you can’t see me in this picture, but I’m lying underneath that funeral pall. It’s symbolic of my death to the world and my total dying to self so that I can fully live my life in Christ. Everyone chants the litany of the saints while I’m prostrate on the ground. And I’ll tell you, I was crying a lot under there – happy tears, tears of gratitude. I had such an overwhelming sense of God’s love and mercy towards me. Then comes the part where I make my actual vows. 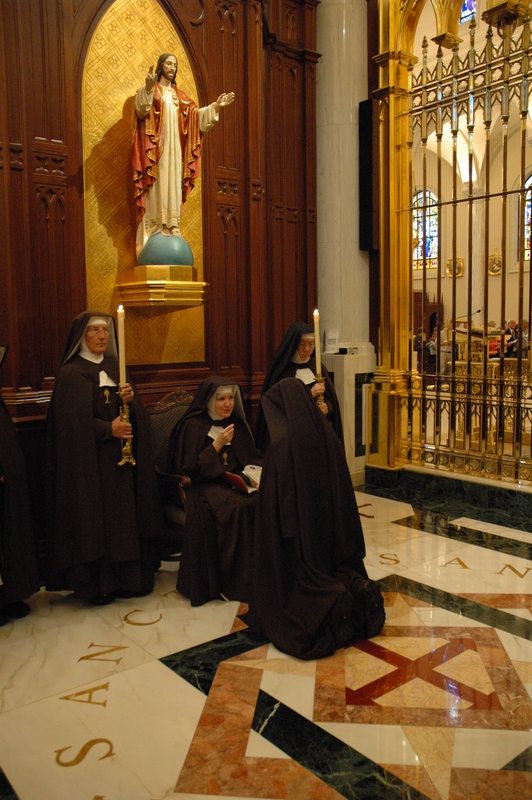 All the solemn professed sisters gather around and act as witnesses, although you can’t see them in this picture. Fr. Phillips, my pastor from home, came from San Antonio, as he had every year since my first vows. Here he is praying a very beautiful prayer over me. I really should post the whole prayer sometime. My wedding ring! The Holy Name of Jesus is engraved on the inside of the wedding band. And here’s me after the ceremony. Like any new bride I’m excited, overwhelmed, unspeakably grateful to God…and maybe a little tired. 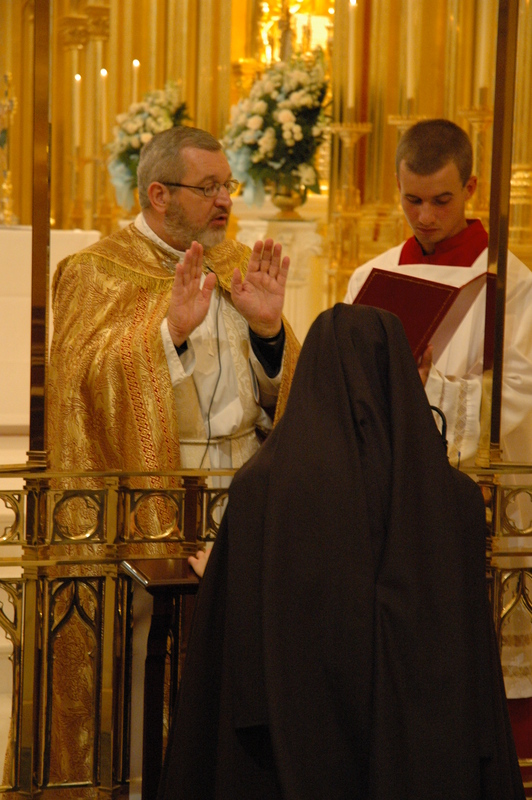 Please pray for my continued perseverance in my vocation, and for the perseverance of all religious. You have no idea how much all of us depend on your prayers, and how much we thank God for your prayerful support. Our Blessed Lord has rewarded me beyond measure, and I pray He will do the same for you. This entry was posted in A Nun's Life and tagged evangelical counsels, religious, solemn profession, vocation, vows by srelizabeth. Bookmark the permalink. Happy 10th anniversary of your final vows!! His love for you is ever new! I don’t know if you remember me, but I am one of the little sisters of a young woman who discerned with your community several years ago. Your community greatly impacted me with desire and courage to follow Jesus’ invitation with full joy. 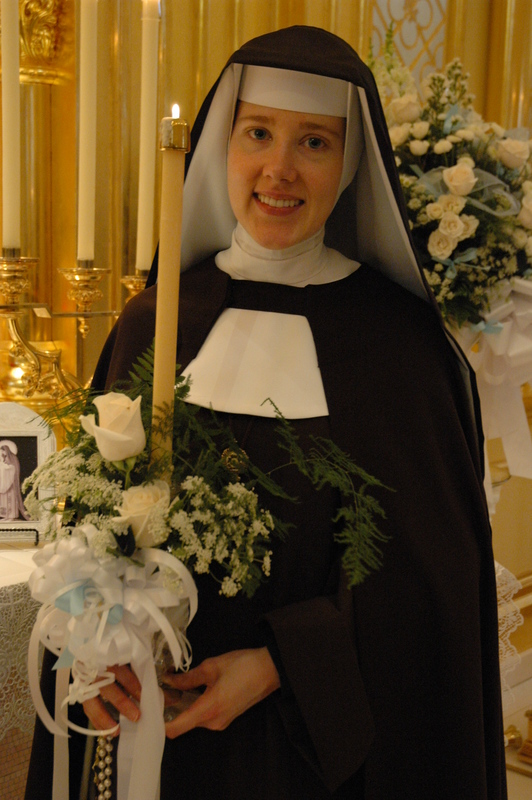 Please pray for me as I will make my final vows this August 2nd in the Sisters of St. Francis of the Martyr St. George. I’m so happy for you and how Jesus has chosen you. Let us pray for one another until we meet in the Kingdom! Beautiful! Thank you for the pictures and story. Inspiring. You have my prayers. Thank you so much for your promise of prayers! Be assured that we will keep you in our prayers, as well. What a glorious day to remember always! I have followed all the Nuns from OLAM, those still there and those that have made new foundations (Arizona and Texas) and those who helped grow ones that were very small (Charlotte). I pray for all of you daily and ask the Lord and his Blessed Mother to keep your vocations strong and that you would be blessed with new vocations. Thank you so much for praying for all our communities. We pray daily for everyone who supports us with their prayers. Sr Elizabeth thank you so much for including the beautiful prayer and the wonderful pictures! I can only imagine how you felt! I will keep you in my prayers. Thank you for your prayers – I mean it when we say we depend on them! Know that we keep you in our prayers before Jesus in the Most Blessed Sacrament. It’s beautiful that you remember your First Communion and Confirmation so well. God can’t be outdone in generosity, and the greatest gift He gives us is Himself. We are so blessed to be Catholic! Happy anniversary Sr Elizabeth! They are beautiful pictures, I bet the seven years have gone really quickly. I always feel that as a lay person I’m so dependent every day on the prayers of our contemplatives – so thank you! I know Teresa of Avila said the hand of God’s justice is held back because of the prayers of religious, but I think there must be a counterpart to that, too, and that God upholds us in our vocations because of the faithful prayers of all the laity. We are so thankful!